If you plan to do a self-supported cycle tour, it will be very helpful having a good guide book or at least a map. 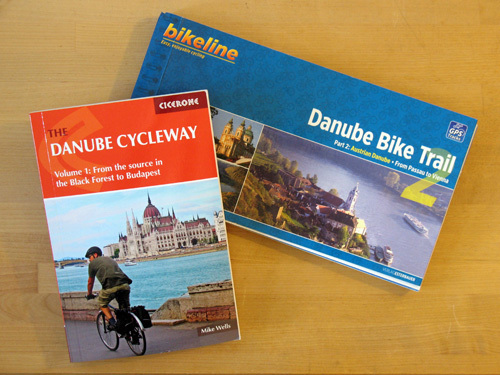 While there are many books out there, the two most recognised ones are the "Danube Bike Trail 2" guide book (by Esterbauer) and the "The Danube Cycleway, Vol. 1" guide book (by Cicerone). We recommend getting the "Danube Bike Trail 2 " guide book. It provides useful maps at a scale of 1:50,000, additional route instructions and hints as well as lists of (probably all) accommodations and camp sites along the cycle path, including phone numbers and price proximates. You will even find cultural information about the places along the way and details about surface and traffic - if there is any. By the way: In case you book a self-guided cycle tour along the Austrian Danube, your local tour operator will provide a copy of this guide book. Surprisingly, we realised that these copies sometimes do not show the pathes on both sides of the Danube. Hence you may get yourself the original Esterbauer guide book despite taking a self-guided holiday - to know all available cycle paths and to see what the paths are like (proximity to the river, flat-ness of the cycleway, safety evaluation). In case you need to safe €3 or €4, you may instead buy the "Donauradweg Danube Bike Trail" book, published at Freytag & Berndt (green-red book cover). However, the provided maps come at a scale of 1:125,000 only.